Our little town in eastern North Carolina is at the epicenter of a region known for its whole-hog barbecue. We’re not shy about reminding you, either — take the dozens of restaurants boasting properly sauced offerings on Highway 70 alone. If you’re visiting us from out-of-town this year, we’ve got your back. Here’s your guide to a handful of the best barbecue our region has to offer, within an hourish drive, plus one. This isn’t an exhaustive list, of course, but some of the highlights you shouldn’t return home without having visited. Don’t miss Vivian’s field notes, either — she’s highlighted some particularly compelling reasons these places are worth the drive or the detour. Insider’s tip: Vivian visited the New Bern Road location on the 5th season of A Chef’s Life and ordered a pig in a puppy. You should, too. From VH: They’re also kind of famous for their collard greens. Cooked soft, chopped to smithereens and sweetened a bit with sugar, they are distinctly ENC. Because BBQ is just a side hustle for these folks, Morris BBQ is only open Saturdays. The Q is good, but I’m a disciple of their hush puppies and layer cakes. Ken’s serves BBQ on Wednesdays and Saturdays. And they DO sell out! Don’t miss the bags of skins and ribs for sell up at the cash register. I’m also a fan of their Friday fish stews. A newcomer to the scene, but John Currin Howard eats there, so it must be tasty. The gold standard. If you come to ENC and don’t eat here, you should be spanked. Also it’s CASH ONLY and ask for a corner piece of cornbread. They may say no, but ask. Taking it back a few years. This photo taken by, and compliments of Mr. Mark Dolan (The BBQ Pilgrim) in 2006. Lightly seasoned, #woodfired, Whole Hog....That’s what we’re all about. Insider’s tip: Vivian made coleslaw with Pitmaster Sam Jones, grandson of Skylight Inn's Pete Jones, on the cabbage episode of Season 4. Sam's expanded his offerings beyond the famous barbecue trays at Skylight just down the road in Winterville. My son’s favorite restaurant. 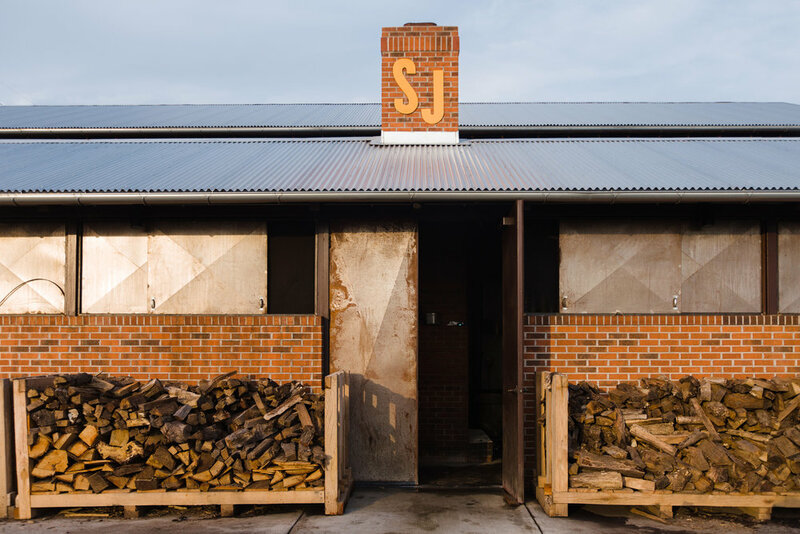 The chopped BBQ, slaw and cornbread is the same as Skylight’s, but SJBBQ offers more options. The ribs are fantastic, and they have the best chicken tenders in the world (I can’t believe I just recommended chicken tenders). Get there early and order the bbq chicken. Known for a lot more than just BBQ, Bum’s serves some of the tastiest Southern style vegetables I’ve had. Get the cabbage, okra and banana pudding. Yes, yes, yasssss is all I’ll say. Grady's BBQ. Wood Fire, Whole Hog Heaven. Possibly the largest buffet in the state. I don’t normally get behind those kinds of eating experiences, but on McCalls steam table you’ll find a smattering of all the things that make ENC food distinct. Spending the day in #goldsboro with @stusand and grandpa. Second plate at McCall's. An old-school favorite that sits just off of Hwy 70. Get the brunswick stew. A little further from Kinston than my other recommendations but only a short detour on the route to Wilmington, Southern Smoke has a more modern (Vivian-ish) approach to their sides. Stuff like succotash, squash casserole, stewed tomatoes and creamed corn are all made from scratch. And these days that’s saying something. Open only on Thursdays and Fridays from 11:30 until they run out.